Established in 1970 by the Belgian photographer and conservationist Adrien Deschryver, the Kahuzi-Biega National Park is named after two dormant volcanoes which fall within the park’s limits. Mount Kahuzi and Mount Biega. The national park covers an area of 2300 sq miles and is one of the biggest national parks in the DRC. The park enjoys both mountainous and lowland terrain and as such is one of the last refuges of the rare species of Eastern Lowland Gorilla. The park is also a UNESCO World Heritage Site, having been inscribed in 1980 for its unique biodiversity of rainforest habitat and of course for the reason you will visit here – the Eastern Lowland Gorillas. 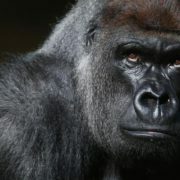 The Kahuzi-Biega National Park is home to 136 species of mammals, with the Eastern Lowland Gorilla the most prominent. These Gorilla are constantly under threat and the park authorities work tirelessly to ensure that the species and the remaining animals are protected. The numbers are such however that the species has been placed on the endangered species list. The park is the last refuge of this rare species, and thus offers the ultimately unique experience of witnessing these incredible animals in their home. Other primates that can be seen in the park include the eastern chimpanzee, and several, Colobine and Owl-Faced Monkey. Some of the mammals include the Bush Elephant, Bush Buffalo and Bongo, Aquatic Civet, Eastern Needle-Clawed Galago, Maclaud’s Horseshoe Bat, Ruwenzori Least Otter Shrew, and Alexander’s Bush Squirrel. The park’s swamps, bogs, marshland and riparian forests at all altitudes are rare worldwide. The western lowland portion of the park is dominated by dense wet equatorial rainforest, with an area of transition forest as well. The eastern mountainous part of the park includes spectacular forest vegetation and is one of the rare sites in Sub-Saharan Africa which demonstrates all stages of the low to highland transition, including six distinguishable primary vegetation types. 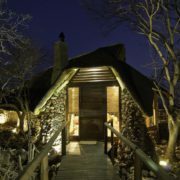 It is no small wonder then that the area offer such a diverse and dynamic safari experience.